The Rams were a bit stretched again this week after adding the St. Mary’s Coed Interconference and hurting with a few injuries and illnesses.We decided to send our 1st team to St. Mary’s with Caleb Armstrong and Rachel Bryer as skippers. Caleb was coming off a very strong performance at the Hatch Brown and Rachel had won her division by 20+ points on her last visit to St. Mary’s. The weekend featured beautiful weather, but little wind at most venues, so racing was limited. 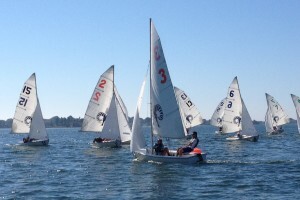 Armstrong, sailing with Elizabeth Durgin, had a rough Saturday, but improved dramatically on Sunday to end 10th in A. Bryer, with Kaity Norton were 8th in B. The Rams ended 9th in the tough 18 team field. We had many good finishes, but too many double digit races. Still, 9th was a respectable, if not totally satisfying result. The Lady Rams were at Boston University for the President’s Trophy. This event provided an opportunity for Mackenzie Needham and Sarah Hermus establish themselves in the Ram lineup. There was little wind Boston, so few races were sailed in a very shifty and fluky environment. Mackenzie, sailing with Nellie Hamilton, had a solid event finishing 3rd in A, but Sarah Hermus and Sarah Leonard struggled a bit leaving the Rams in 7th in the 14 team field. The Rams were also at Tufts (sailing on the “Mystical Lake”) for the Hood Trophy. Matt Coughlin was to get his first test after breaking his arm, but had to wait until Sunday as the lake was windless all day. Sunday wasn’t much better and only 4 races were sailed in each division. Coughlin, with Matt Sola, were rusty in the first set but closed with 7, 2. Patrick Penwell and Jack Hurley were in A and were “Mystified” by the lake. In the end, the Rams were 15th in the 20 team field. Back to the drawing board. The Rams hosted the Salt Pond Invite which turned out to be an awesome event. Eighteen teams did battle in a 4-6 knot southerly on Saturday and a 6-12 knot southwesterly on Sunday. Perfect conditions. The Rams, with Sam Cushing and Liz Early in A and freshman Peter Girard with Matt Gibbs in B, lead wire to wire, winning both divisions. For Peter and Liz, this was their first collegiate event.